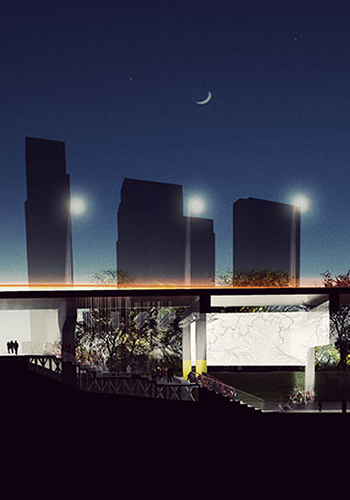 Toronto will soon transform the space beneath one of its elevated expressways into a multi-use public park and trail system. 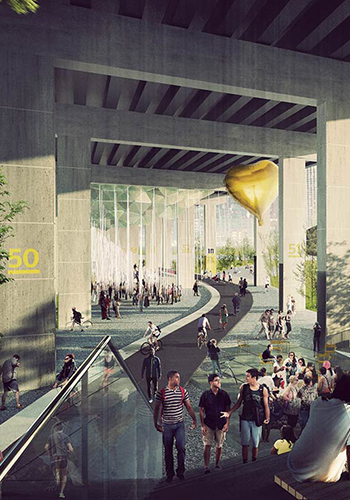 Project: Under Gardiner, situated beneath a mile of the Gardiner Expressway, will connect seven neighborhoods in the eastern part of the city, including Toronto’s revitalized waterfront. Drawing comparison to Miami’s Underline, Under Gardiner, designed by urban designer Ken Greenberg with Adam Nicklin and Marc Ryan of Public Work, is centered around a bike and pedestrian trail that will stretch from Stratchan Avenue to Spadina Avenue. Although significantly shorter than the 10 mile-long Underline, the trail is equally connective to surrounding trails and green spaces. Under Gardiner will link to an extension of the West Toronto Railpath, expected to be completed in 2018, as well as a pedestrian foot bridge extending from a new series of parks near Fort York Boulevard, which will begin construction in 2016. Under Gardiner is more than a trail. The columns holding up the expressway will serve as dividers for a series of up to 55 covered “outdoor rooms” that will host a “kaleidoscope of year-round destination and activities including gardens, an adventure playground, public markets, art fairs and exhibitions, festivals, theatrical and musical performances,” according to a press release. Toronto’s Gardiner Expressway has long been the subject of controversy. It has been on the chopping block for more than twenty years, with the Toronto City Council finally voting against tearing it down in June. 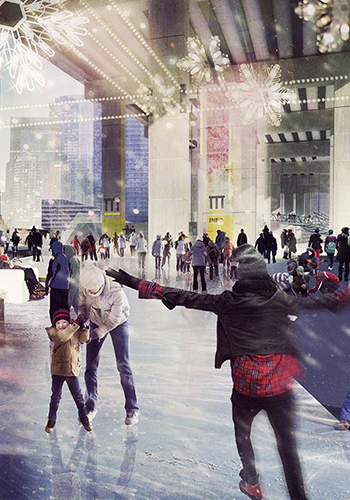 At one point it was even envisioned as a $600 million dollar High Line-style park. However, a $25 million donation from philanthropists Judy and Wil Matthews – the entire cost of the project — makes Under Gardiner much more feasible as a “suture for the city’s downtown neighborhoods and the waterfront,” according to The Star. The city is currently investigating if Under Gardiner can be managed by a non-profit park conservancy that would work in conjunction with the city. Toronto’s park and public spaces have never seen this sort of partnership nor a donation this large, according to The Globe and Mail. The Toronto City Council will decide in early December “whether they should accept the $25 million” and begin work on the project in 2016, according to Citylab. One of the first steps after approval will be giving the project a new name that is “uniquely Torontonian,” through a “Reclaim the Name” campaign.